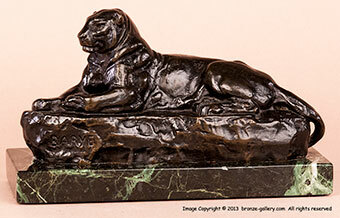 The Panther of India is one of Barye's best known sculptures. Ferdinand Barbedienne the famous foundry owner admired Barye greatly and cast Barye's sculptures for several years using the artist's original master models. Barbedienne took great care to produce casts of the same high standards of Barye himself and that he felt would keep Barye's art in the hearts and minds of all Frenchmen. This cast was done by the Barbedienne foundry, it has their foundry mark and is a sand cast bronze of excellent quality with sharp detail, it is finished in a dark brown patina. 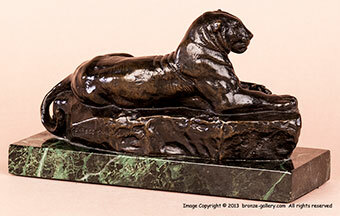 The Panther of India is mounted on the original 3/4 inch thick dark green marble base. Please be aware that there are many forgeries of the Panther of India on the market and some bear the Barbedienne mark but they are not genuine Barbedienne casts. Barye’s Panther of India is a stately beast and is shown in repose relaxing like a house cat. His front paw is turned and he has a regal look, yet there is tension shown in the angle of his tail. Like any cat, he is relaxed yet ready for action at any time. The Panther of India is a companion piece to the Panther of Tunis, they were made as pendants and also work well as single sculptures. Les Animaliers by Jane Horswell, pg. 63. Animals in Bronze by Christopher Payne, pg. 130.